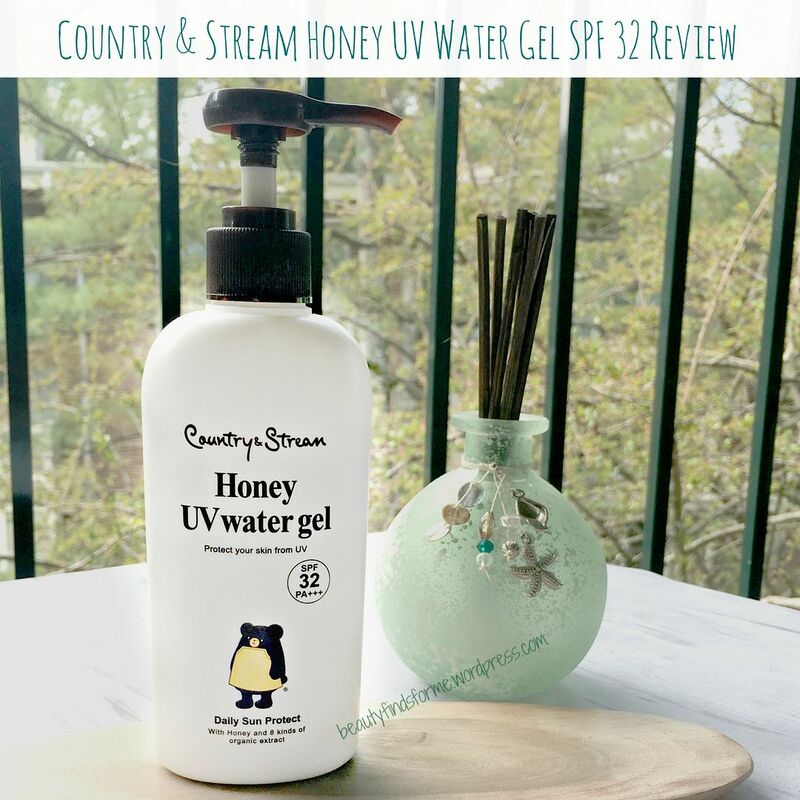 Country & Stream Honey UV Water Gel SPF 32 Review + Comparisons! So a couple of months ago, I saw on Beautius IG feed this HUGE bottle of sunscreen. If you don’t know about Beautius, you should! This Hong Kong Asian online beauty store has an amazing selection of brands and the owner, Tracey, provides fantastic customer service and always is generous with the freebies and extras! You should shop there and I will post more information at the end of this review. Skin Type/Concerns: Oily, blemish prone, aging skin with hyper-pigmentation, fine lines and wrinkles. Now, I know I am sounding like a broken record here, but I am going to repeat my standard blog blurb on sunscreens. We all know what SPF rating means, but what does PA stand for? I am very familiar with SPF (sun protection factor) and that it ranks based on protection from UVB :: ultraviolet B (shortwave) rays. But the PA rating is something newish to me, and I really notice it on Asian sunscreens, not so much American brands. 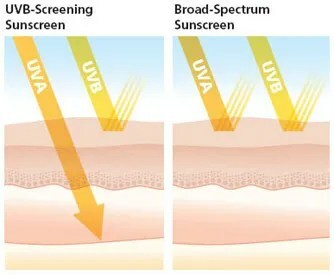 PA is the amount of protection the sunscreen offers from UVA :: ultraviolet A (long-wave) rays. PA ranks with + signs and the higher the + signs, the more protection you will get from UVA rays. 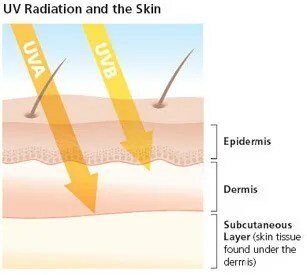 UVB is what causes sunburns and reddened skin and has direct links to cancer. UVA is what causes us to tan, and age ~ wrinkles and deep lines are caused by UVA exposure. A really fantastic article about ultraviolet rays and how they affect our skin can be found here at the Skin Cancer website and I highly recommend reading it. One thing I have learned is that a broad spectrum sunscreen is the proper choice as it will help deflect the UV rays and not allow them to penetrate into your skin layers. TL;DR: You need to wear them. Don’t skimp on or skip this step. Country & Stream is a Japanese brand that looks to specialize in two different skincare lines ~ Apple and Honey. I haven’t tried anything from the Apple line yet, but their honey line is quite extensive, ranging from lotions (toners), moisturizers, peeling gels, lip oils and sunscreens. I also happen to love their website, as they list their ingredients, which I can translate to English. 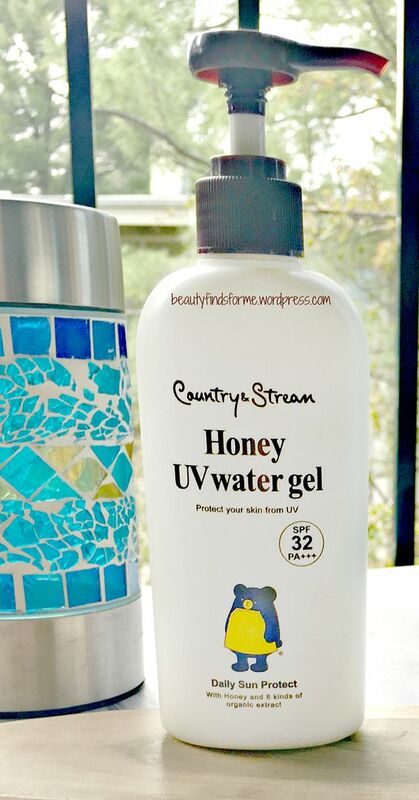 Country & Stream Honey UV Water Gel SPF 32 PA+++ (yeah, a long name!) 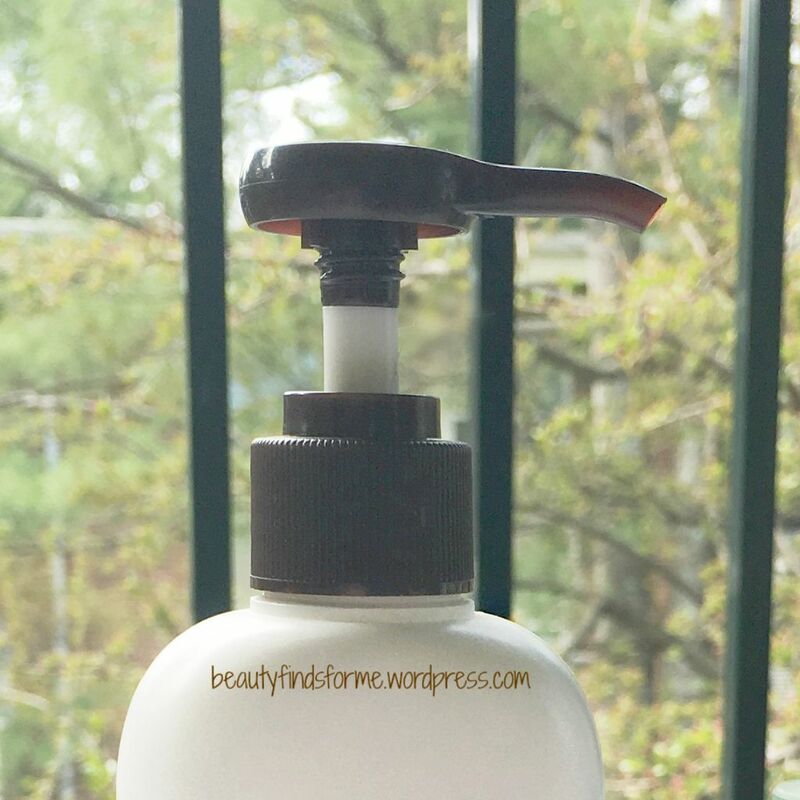 comes in this huge 180 mL off-white bottle that has a brown pump applicator. It has a cute bear logo ~ that is their bear mascot Kansuto (or Kansuton, Google Translate is a bit wonky on this front), cause bears love honey! I like that this has a pump applicator as I can quickly apply this not only on my face, but on my neck and arms. The texture of this is a very light weight gel-lotion, that quickly turns watery when I spread it onto my skin. The scent is not heavy, but a nice light honey-lemon scent ~ very pleasant. This does contain alcohol in it, but there is no alcohol scent to this sunscreen. This spreads so easily and absorbs so quickly too ~ no white cast and it is almost like I didn’t put anything on my skin! No tacky residue and it dries down nicely and quickly, without any dewy finish on my already naturally dewy oily skin. The quick dry is so important when I am trying to get ready for work ~ I am impatient to start with my makeup! This also easily washes off with soap as well. This has two UVA/UVB ingredients in here ~ octinoxate, aka ethylhexyl methoxycinnamate, is very common in sunscreens as an active to protect skin against UVB rays. It should be used along with another UVA ingredient, which in this case is diethylamino hydroxybenzoyl hexyl benzoate ~ aka Uvinul A Plus ~ this ingredient will protect skin against UVA radiation and works well with other UV ingredients. This has 3 types of hyaluronic acid in it so it is intensely hydrating on my skin, but not greasy. It also has honey, which has antibacterial properties so it will help heal skin problems, like blemishes ~ and it is also a humectant, which means it attracts moisture too. Honey is also an antioxidant, which means it helps repair and combat any damage caused by free radicals and prevents premature wrinkling. Royal Jelly is another honey bee product ~ it contains B-complex vitamins, nucleic acid, decanoic acid, flavonoids, essential fatty acids, amino acids, enzymes, minerals and natural antibiotic and antibacterial compounds. It is an anti-aging ingredient as well, as it can increase collagen production in your skin. increased collagen production. Speaking of collagen, this contains both soluble collagen and hydrolyzed collagen, which will deeply moisturize your skin. There are also a lot of botanical herbs in here ~ job’s tears, lavender, rosemary, thyme, sage, green tea, chamomile along with lemon peel and vitamin C. This is one nice looking sunscreen with so many antioxidant, soothing and protecting ingredients. Obviously, this is not a sunscreen if you are into extreme outdoor sports or watery sports. This is not a sweat, oil or water proof sunscreen, but it is great for daily normal use ~ I am usually in my home, get into my car, drive to work, sit at my desk, go out to lunch, get back to my desk, drive home, stay home – 5 days a week. So I know this is only a SPF32, but I am not too worried about this for my normal daily use and I love the scent, the ease of application with the pump and how quickly it absorbs and dries down on my skin. I obviously need something a little stronger if I am going to be walking around outside for more than 15 minutes at a time and for that, I do still want a SPF 50. Which leads me to…. 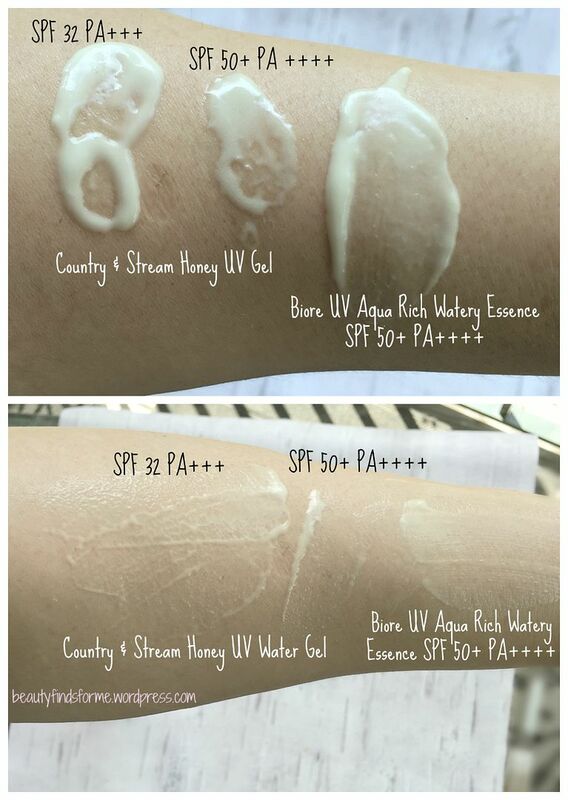 So I was thinking I would just compare the 2015 Biore UV Aqua Rich Watery Essence SPF 50+ PA++++ vs Country & Stream Honey UV Water Gel SPF 32 PA+++ as that is all I had. 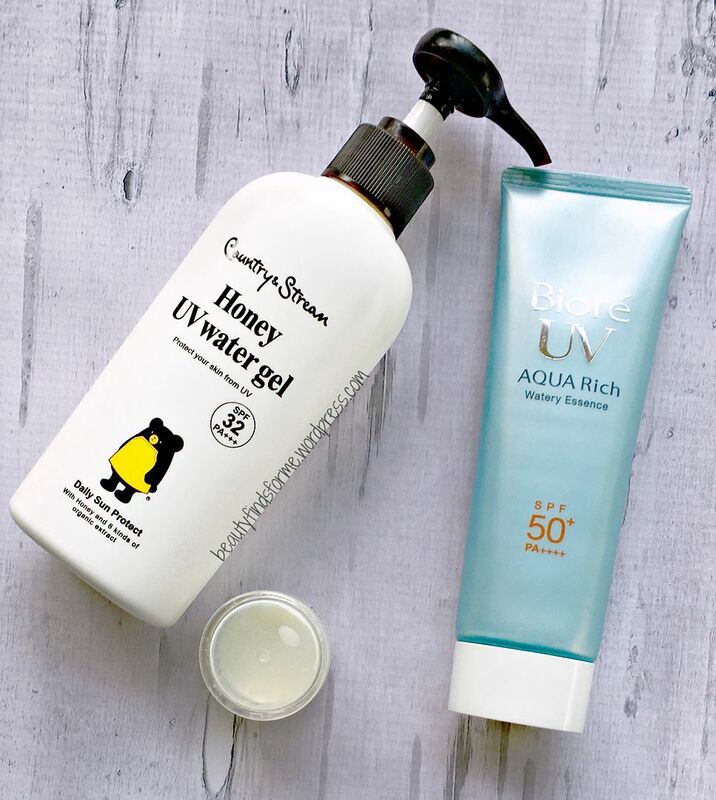 I wasn’t sure if I wanted to purchase the Country & Stream Honey UV Water Gel SPF 50+ PA++++ version, as I couldn’t find any reviews on it at the time. However, my good friend @saltwaterglow had this sunscreen and decanted a little pot of it for me to do an initial test on it. I will post the ingredients for both the 2015 Biore and the Country & Stream SPF 50 sunscreens at the end of the comparison. By now, you know that the Country & Stream Honey UV Water Gel SPF 32 PA+++ contains 2 different types of UVA/UVB filters: Octinoxante (UVB) and Uvinul A Plus (UVA) , smells like honey lemons with no alcohol scent ~ despite containing alcohol ~ has 3 types of hyaluronic acid, 2 types of collagen, royal jelly, honey and soothing, antioxidant, moisturizing-rich herbal ingredients. It has a very liquidy texture that turns to a watery essence, absorbs quickly and dries down nicely, with no sticky residue. This has the bonus of being HUGE and having a pump applicator. Country & Stream Honey UV Water Gel SPF 50+ PA++++: This contains 5 different UVA/UVB filters: ethylhexyl methoxycinnamate (Octinoxate), which protects against UVB rays; Uvinul A Plus (diethylamino hydroxybenzoyl hexyl benzoate), 2 physical blockers, zinc oxide and titanium dioxide, which in combination, block both UVA/UVB rays and finally, bis-ethylhexyloxyphenol methoxyphenyl triazine (Tinosorb S) absorbs UVA/UVB rays. This has the same watery texture as SPF 32 and leaves no white cast, even though it has zinc oxide and titanium dioxide. This has the same 3 types of hyaluronic acid, 2 types of collagen, royal jelly, honey and soothing, antioxidant, moisturizing-rich herbal ingredients. The SPF 50 version does not contain alcohol. In fact, I was hard pressed to tell the difference between the two swatches, as they looked, smelt and felt the same way. When I wore this outside over the weekend, I got the extra protection I needed from the rays. This does come in a tube, so I will miss that pump applicator. 2015 Biore UV Aqua Rich Watery Essence SPF 50+ PA++++ is thicker in comparison to either versions of the Country & Stream Honey UV Water Gels. I can really tell the difference on my skin that it is thicker, but still watery ~ it absorbs nicely, hydrates beautifully and smells strongly like alcohol initially, but that disappears. It doesn’t leave a white cast and has worked beautifully for me for a few years. It contains 3 UVA/UVB filters: ethylhexyl methoxycinnamate (Octinoxate), which protects against UVB rays; bis-ethylhexyloxyphenol methoxyphenyl triazine (Tinosorb S), which is both UVA and UVB filter and Uvinul A Plus (diethylamino hydroxybenzoyl hexyl benzoate) protects against UVA. This contains royal jelly, sodium hyaluronate and a trio of citrus extracts ~ orange, grapefruit, lemon. 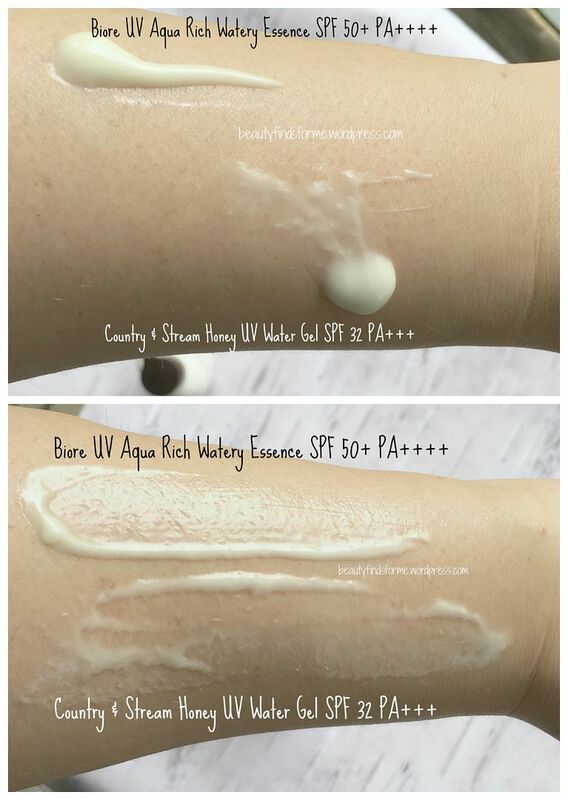 I wanted to show you how watery the Country & Stream is ~ this was an initial swatch test just between the Biore and SPF 32. See how the Country & Stream is sliding down my arm in the top photo? It actually did start out right under my watermark and just slide down as it was so watery and lightweight. I hate to say it… but with 5 different UVA/UVB protectors, honey lemon scent and watery essence, Country & Stream Honey UV Water Gel SPF 50+ PA++++ wins over Biore. Even if Biore didn’t reformulate their 2015 version, I would pick Country & Stream over it, due to the scent and absorbability. For those who are seeking an alcohol free version but loved the 2015 Biore, you would really enjoy this sunscreen. The SPF 32 is fantastic as well and I love the pump applicator, but if I want a higher protection, the SPF 50 is the way to go. I was afraid that the SPF 50 would be thicker, have a white cast, not absorb as nicely as the SPF 32 version, but really, I couldn’t tell the different between the two. My only concern is that I had read that the Country & Stream SPF 50 version is a special edition, so I am not sure if they are going to continue making it. Let’s hope they do! I did purchase the SPF 50 version once I saw how it was so similar to the SPF 32 version. Obviously, good luck with the 2015 Biore UV Watery Essence ~ some people have ordered it from sellers and received the new 2017 version… I have a few tubes left, but I will use them up quickly this summer. However, both Country & Stream Honey UV Water Gel are available at Beautius. Either version gets a thumbs up from me! Beautius not only has free shipping with orders over $45.00 in most countries ~ click here to see their shipping rates, which are very reasonable ~ they have global shipping all across the world and they have a Beautius Rewards Program. For every purchase, you will get b-points, which then can be used as cash for future purchases in their store. If you have never registered before with Beautius, use my referral link (click here) and get $1.00 in b-points to start you off! Welp, I just bought both of them from Beautius! Thanks for your thorough review, I love that the SPF 50 has so many great filters and the SPF 30 sounds perfect for my husband at work! I ordered the SPF 50, can’t wait to try it!